Furry art community Fur Affinity has been struck by a visual meme, as artists depict their characters either enjoying or unable to enjoy their food. 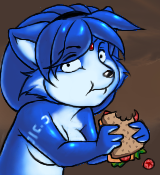 The meme began on Sunday night, when a user named "krystalcantenjoyhersandwich" extracted part of an image uploaded by cbee featuring popular Star Fox character Krystal. cbee drew and posted the original to Fur Affinity on June 9. I originally drew this while being on a Bob Ross high on the Kemonoart oekaki board. Krystal was added as an afterthought and to meet an unwritten "must contain furry" rule. The new user inserted cbee's drawing of Krystal into photographs of disastrous events which might be expected to make her sad, and uploaded them to Fur Affinity. They also added the character to a drawing by another artist, resulting in a complaint. cbee considered his own work free to use, and other artists created and posted their own art based on the theme. The new user and cbee were banned, and many related images were removed, including the original. cbee's ban was lifted an hour later by Pinkuh, who admitted it was a mistake. The removed images were reposted shortly afterwards on furry imageboard Lulz.net. The activity prompted over 150 users to create and post variations of the image using their own characters. Tuesday's issue of Vinci & Arty was devoted to the meme. By Wednesday morning, Fur Affinity's own logo had changed to incorporate the meme, using Muzz's picture of site mascot Fender eating his own tie. What ancient furry in-joke most needs a comeback?